Country Artists celebrated its 20th anniversary in 1998, beginning life in 1978 at Tanworth-in-Arden in Warwickshire, England. Initially called “Richard Cooper and Company”, and later “Richard Cooper Giftware Ltd” and in 1987 became “Country Artists”. 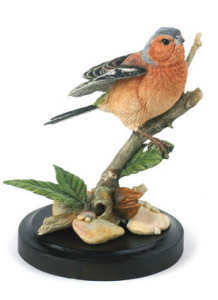 Pictured right: Chaffinch With Beech Mast from the Broadway Bird Range. produce detailed animal sculptures. Part of the company philosophy includes a ‘commitment to conservation’. The Country Artsists Collector’s Guild allows members to receive a special Limited Edition case bound Collectors book, copies of Country Letters throughout the year and the opportunity to purchase exclusive collectors only sculptures and receive invites to collectors events. Membership is FREE to anyone purchasing a model from the Broadway Bird Range. The Official Country Artitsts web site. Note: This site is not affiliated with Country Artists TM. It is designed to provide information to collectors of Country Artists Figurines.